It was a lovely sunny September day at the beach, and everything was casual, relaxed, and beautiful. This is our pie buffet. I've made a lot of wedding cakes in my life, but I don't really love cake. Cake is showy, cake has flash. A wedding cake is a diva, a showstopper, an attention whore. And there's nothing wrong with that. I love a bit of flash, myself, in the right context. An Art Deco wedding in the evening at a fabulous old hotel calls for a fantastic cake to match the bride's fantastic dress and oceans of calla lilies and the sparkle of the guests' jewelry. But this was a different kind of wedding. We had our ceremony on the beach. We walked in together. Our "attendants" wore their own clothes. I carried daisies. We ate barbecue. Our friends' children spent the day climbing on the rocks. And what we need was pie. Homey pie, humble pie, delicious pie. Pie is the dessert of summer barbecues, of winter holidays, of family dinners after a day of picking apples or berries. Pie is love to me in a way cake could never be. And so we ate pie. What did people eat the most of? The key lime, chocolate French silk, blueberry, chocolate peanut butter, triple cherry and pear-cardamom were wiped out completely. ( At least the first round, we had a few back up pies that didn't get eaten entirely). Only one slice remained of the pecan and apple, while the peach and pineapple were half-left (my mom loved the pineapple, though, so the remainder went home with her). Only one piece was missing from the sweet potato. That's okay - I got to take that home, and I love sweet potato pie. The pies were almost all homemade. The sweet potato and the pecan came from our caterers, the wonderfully affordable and delicious Blue Ribbon BBQ. My mom made three French chocolate silk pies, her specialty, and I topped them with chocolate curls. That was the pie we cut and fed to each other. 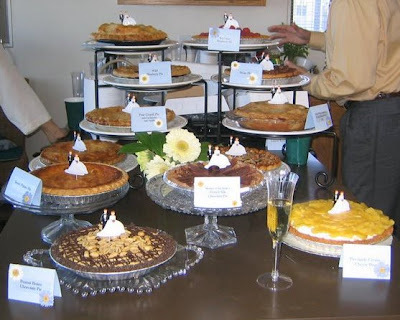 The chocolate peanut butter, key lime, and pineapple cream pies were frozen completed and just needed to thaw in the fridge the night before, while the fruit pies were all frzoen unbaked and baked off the morning before the wedding. Turns out you need to bake fruit pies almost two hours if they enter the oven straight from your deep-freeze. It's okay, the bottom crusts had time to brown, even in the aluminum pie plates. I tried to make each pie look a little different - raspberries piled on the lime pie, poached pineapple slices on the pineapple cream, the various fruit pies with different cutouts or edges or lattice. And then, of course, each one got a little bride and groom. I have to admit, dorky though it is, I loved those little bride and groom toppers.